This glazed pizza stone is your ticket to perfectly crispy, delicious pizza in the comfort of your own home. The glazed stone heats up to extremely high temperatures and transmits that heat into your pizza, creating the crispiest crusts and crunchy melted cheese toppings. It's also great for baking bread, pastries and free-form tarts. 1. Preheat your oven to 240°C / 464°F with the pizza stone placed in the middle on the lowest rack. Never put a cold pizza stone in a hot oven as the sudden increase in temperature could crack the stone. 2. 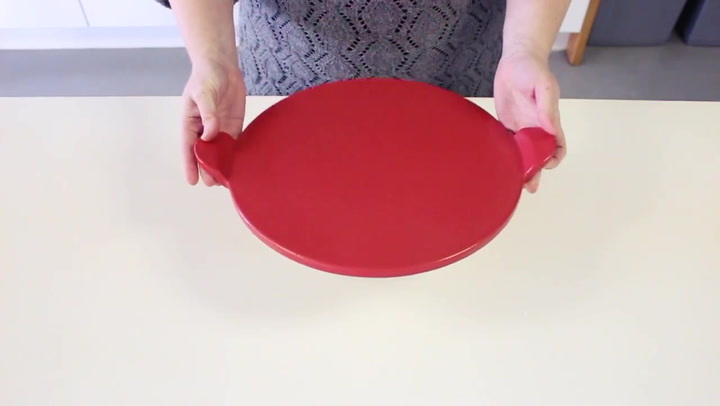 Place the pizza onto the stone using a pizza paddle or wooden board. Tip: Sprinkling polenta on the stone and the pizza paddle or board helps prevent the pizza base from sticking. 3. When your pizza is ready, you can remove the pizza from the oven, leaving the stone to retain its heat until you're ready to cook the next pizza, or serve directly from the stone at the table. 4. You can cut directly onto the surface of your pizza stone, as the glaze is very resistant. 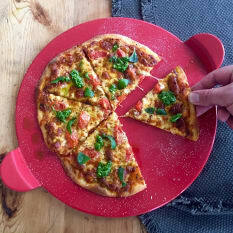 View more from Italian Collection, Pizza Collection, Pizza Stones & Pans, Yuppiechef Cookware. Fabulous crispy crust pizza every time. Great for crispy pizza bases. Love that its glazed as I can wipe it thoroughly. Don't bake pizza without it! I've read on numerous recipes that a pizza stone is what you need for good pizza in an electric oven. To replicate a clay wood-fired oven. It proved to be exactly that - the base is done before toppings start boiling and it also has the right amount of crispiness. The glazed surface also cleans fairly easy. That's why I say, don't bake pizza without it! Just what I needed. My family love pizza and this product answers to all their expectations.